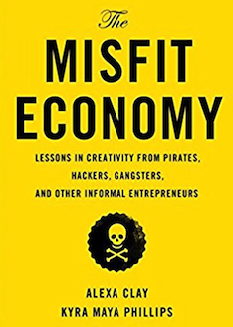 Can misfits teach us a thing or two about innovation? I just finished reading Alexa Clay & Kyra Maya Phillips tour de force, The Misfit Economy. I have to admit I was surprised & delighted by the book. Alexa & Kyra offer us a tantalizing question. Could it be that we could learn a lot from oddball innovators at the edge of the economy? When I say edge, I really mean it. She interviews Sam Hostetler who is building a business around milking camels, and then there’s Abdi Hasan a pirate from Galkayo northern Somalia. Yeah really! Or what about the German copycats Wimdu who built a complete replica of Airbnb by reverse engineering it. Take the example of Lance Weiler. Early on the industry was very against digital. They didn’t see it as really making films. He was later able to bring digital projection to Cannes & Sundance! The german brothers Oliver, Marc & Alexander Samwer make a superb example of how copying can bring building prowess to compete against innovators that were first to market. Although not mentioned in the book, Inditex the wildly successful firm behind fashion brand Zara did much the same thing to the fashion industry. By mastering the supply chain, they enabled their company to take designs from the runway & replicate them, turning designs into real clothing in stores, in just two weeks! And indeed they really do replicate, borrow & straight copy those designs from what they see at fashion week. Sad & brilliant at the same time. And after all, isn’t that everything the startup industry aspires to? Agile teams? Growth hackers? Scrappy startups & innovation? Disqus wasn’t showing up on blog posts. Previous PostPrevious Can daily notes help you work better with clients? Next PostNext How can I get started with lambda and nodejs in 5 minutes?